Video games aren’t just for kids anymore—and indeed, some of the best (and often bloodiest) games of recent years have been aimed squarely at grown-ups. But while I’ll admit to being an eager participant in such gore-fests as “Gears of War” and “Call of Duty,” I’m not a fan of letting little ones join in the M-rated fun. The good news for parents with pint-sized gamers (and I will be one of those parents very soon, by the way) is that all the big-name consoles—including the Nintendo Wii, the PlayStation 3, and the Xbox 360—come with a full arsenal of parental controls that will lock out specific games according to their ESRB (Entertainment Software Ratings Board) ratings. What’s an ESRB rating? 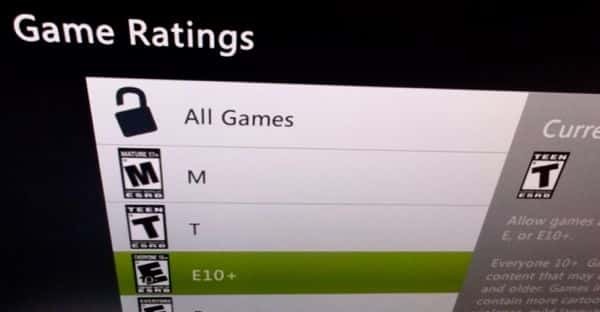 Similar to MPAA ratings for movies (you know, “PG,” “PG-13,” “R,” and the like), ESRB ratings are assigned to video games depending on their content, ranging from EC (Early Childhood) all the way to AO (Adults Online). In-between, you’ll find E (for Everyone), T (Teen), and M (Mature). All right, so how do you activate parental controls on the Wii, the Xbox 360, or the PS3? Just follow these steps. Select “Parental Controls” button, then follow the prompts to create a passcode and a security question (in case you forget your PIN). Next, click the “Game Settings and PIN” option and “The Highest Game Rating,” then select the maximum game rating you’d like your kids to be able to play. All set? Click “Confirm,” then “Settings Complete” (or “Other Settings” if you’d like to change the parental controls for other content on your Wii). Turn on your PS3, then navigate to Settings on the main menu; scroll almost all the way down and select Security Settings, then choose Parental Control. Once you’ve picked a level, a page will appear confirming your choice. You’ll also get the option to block and game without a rating; check the labeled box to enable to option. Fire up your Xbox 360, then navigate to Settings, Family. Up at the top of the next screen, turn the Content Controls setting to On. Next, select Change Pass Code, Set Pass Code (to create your four-digit PIN and a security question), and then follow the prompts. Once you’ve set up your PIN, select Done to return to the main Content Controls menu. Next, select Ratings and Content, Game Ratings, then choose the maximum allowed rating for your kids, from EC to M.
Click your game controller’s “B” button to back up to the main Content Controls menu, then select Save and Exit—or, to set parental controls for other content, select “Ratings and Content” again. Have more questions about the parental controls in your gaming console? (There are many more settings, by the way, regulating everything from movie rentals to web browsing.) Let me know. Note: This updated and revised post was first published in June 2011.